Prospective accountants in Alabama can choose between approximately 40 accounting schools, including prestigious institutions such as the University of Alabama and Auburn University. Both of these have been consistently highly ranked by U.S. News and Businessweek. Moreover, in the 2013 Public Accounting Report survey of accounting professors, the University of Alabama secured the 23rd place among the best undergraduate accounting programs in the country. Alabama accounting programs range from certificates to doctoral degrees, with just under 10 schools offering advanced degrees. While accounting salaries do not rise above the national average in this state, motivated students will find plenty of opportunities for a top-quality education and a successful accounting career in Alabama. Imagine your first job interview as a graduate of your chosen accounting program. What will your employer expect? You’ll need specific skills, knowledge of accounting, business and finance, as well as hands-on experience. You’ll also need to stand out from countless other graduates applying for the same job – and this is why your accounting degree matters. There are few other academic fields so directly connected to their job counterparts. So when you choose your accounting school, do it with the future in mind. Choose an AACBS-accredited program with excellent rankings and good CPA exam pass rates. And don’t just take the word of the university for it – ask to see statistics, student evaluations and graduate employment rates. Moreover, an accounting program should not only excel at teaching the theory – it should also help you become a good accountant. Find out what opportunities for hands-on experience are available, whether through internships, student organizations, field projects, business competitions or volunteering. You should also take a look at the recruiters present at the school’s careers fair, as big firms are known to target graduates of prestigious programs. In short, a demanding, high-quality program can provide you with sufficient skills and experience to enter the job market with confidence. So when it comes to your education, don’t settle for anything less than the best. Becoming an accountant takes dedication, time and hard work. If you have an analytical mind and a knack for business and finance, you might find a rewarding career path in accounting. However, you’ll have to start by getting a solid education to prepare you for future challenges in the field. While a four-year degree is usually enough to work as an accountant, if your goal is to become a Certified Public Accountant (CPA) you’ll need to complete 150 college credits, usually taken over 5 years. These have to include accounting, business and economics courses. You will want to enroll on the best possible accounting program in order to prepare for the challenging four-part CPA exam. If you pass the CPA exam, you will still need to fulfill additional requirements – such as taking an ethics course and acquiring at least one year of accounting experience – before you can be issued a CPA license. However, once you’ve overcome all these challenges, you will find that a CPA license brings you many advantages – including a higher salary and much broader employment opportunities. Sure, becoming an accountant is not easy; but if you are passionate about the field, the rewards are bound to outweigh the difficulties. CPA candidates in Alabama are required to complete a baccalaureate or higher degree with a minimum of 150 college hours. Out of these, accounting courses above introductory level must amount to at least 33 hours, while another 27 hours should consist of business courses and 3 hours of business law courses. After passing the CPA examination, candidates also need to pass an ethics examination before they can be granted licensure. Moreover, in order to obtain a permit to practice, Alabama CPAs need to acquire one year of experience in public accounting or two years in industry, business, government or academia. The average annual salary for accountants in Alabama does not stand out in nationwide statistics, with a value of $63,910 in 2013, about $1,000 lower than the national average. The state also reports a medium employment level of accountants. However, there are significant variations in accounting pay levels depending on location, experience and career path. In Alabama, developed areas such as Tuscaloosa and Dothan boast mean annual salaries around $70,000, significantly higher than the national average. Moreover, accounting professionals can earn very differently, with the lowest paid percentile in Alabama earning an average of $38,150, while the highest paid percentile earns an excellent $95,330 on average. The accounting program at Auburn University was rated as the 22nd best in the medium institution category at the undergraduate level and 20th at the Master’s level by the PAR 2013 survey. Ranked 91st in the country by U.S. News, the university offers a prestigious AACBS-accredited program for both undergraduate and graduate students. Moreover, the university’s Raymond J. Harbert College of Business boasts a CPA exam pass rate of 10 times the national average and excellent graduate employment rates. 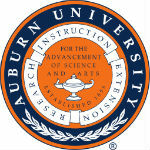 Auburn University offers an Accounting Major and Minor, as well as a Graduate Certificate in Accountancy and a Master of Accountancy. The studies can also be undertaken online and students wishing to become CPAs can opt for an integrative five-year study plan. This means that regardless of your current professional commitments and career goals, the Auburn accounting program offers flexibility to suit your needs. Moreover, internships, student organizations and career development services provide opportunities for real-life experience and open the door to the rewarding accounting career that every student desires. 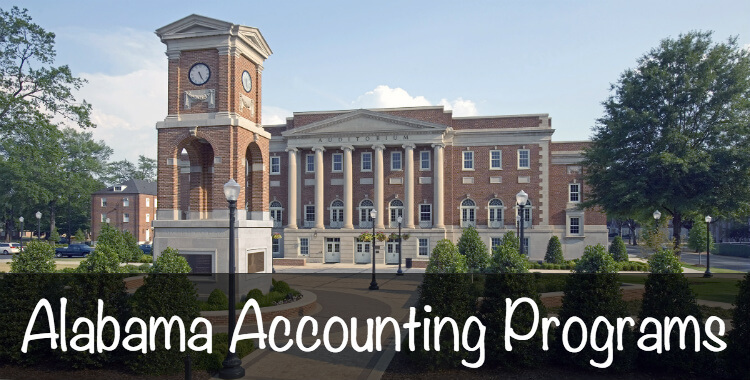 The University of Alabama’s prestigious Culverhouse School of Accountancy and Manderson School of Business offer highly regarded accounting programs at both the undergraduate and graduate level. Ranked 86th nationwide by U.S. News, the Tuscaloosa-based University of Alabama boasts a fully AACBS-accredited accounting program designed to prepare students both for the demanding CPA exam and for a successful accounting career. Undergraduate students can pursue a Major in Accounting that covers auditing, taxation and accounting with the goal of enabling students to successfully manage financial accounts. A specialization in Professional Accounting is available for students wishing to pursue a Master’s Degree in Accounting and to sit for the CPA exam. Graduate students can choose between a Master of Tax Accounting and a Master of Accountancy, both of which provide excellent in-depth knowledge of accounting. With a graduate employment rate of over 70% and employers including Fortune 500 companies and the Big Four, the University of Alabama opens great perspectives for accounting graduates. Through internships, workshops and student organizations such as Beta Alpha Psi, the Culverhouse College of Commerce promotes hands-on experience as a vital part of its accounting curriculum. The blend of high quality teaching and practical experience, along with the consistent high rankings, recommend the accounting program at the University of Alabama as the top program in the state.